In a bowl, add corn flour, plain flour, chilli powder, 1/2 tsp chopped ginger-garlic and salt and make a batter adding little water. Mix the chopped baby corns in the batter and deep fry in the oil till golden brown and keep it aside. Heat oil in a pan, add 1/2 tsp chopped ginger-garlic and onion and saute well. Add soy sauce, tomato sauce and fried baby corns and mix well. Looks so tempting!! My daughter will love this! This dish looks great. a very new recipe for me which I will be trying out soon. Lovely Manchurian, a great side for fried rice!! The texture is super cool and it looks fresh & shiny :) I usually have this combination once a week at least! 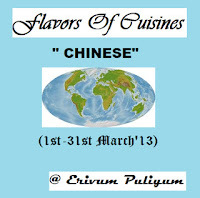 Chinese recipes are very addictive :). You have a great blog and i just had a glance and there are lots of thoran recipes, and they are one of my favorites too. 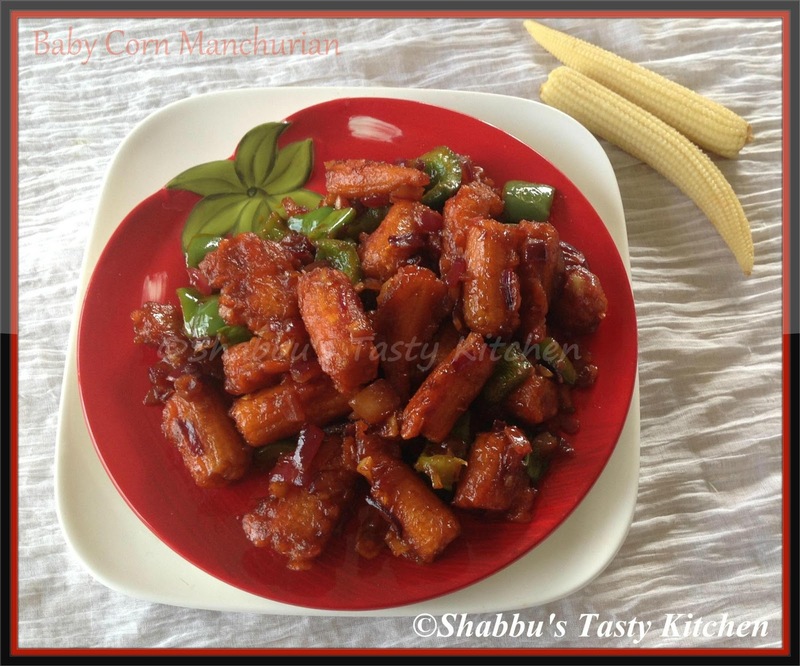 Dry baby corn manchurian tempts me Shabna. Very appetizing. Looks great. Did you have it with the veg noodles ( previous post)? Yum. Super crunchy looks perfect... looks so delicious...first time here you have a great space..happy following you...when free drop into my space..